LANDOVER, Md. (AP) — After letting the ball slip out of his hands on his first carry, Ekeziel Elliott was determined not to let his Dallas Cowboys teammates down again. Elliott bounced back from his fumble to run for 150 yards and two touchdowns as the Cowboys took advantage of a blocked field goal and three turnovers to beat the Washington Redskins 33-19 in a wet, sloppy game Sunday to move into sole possession of second place in the NFC East. 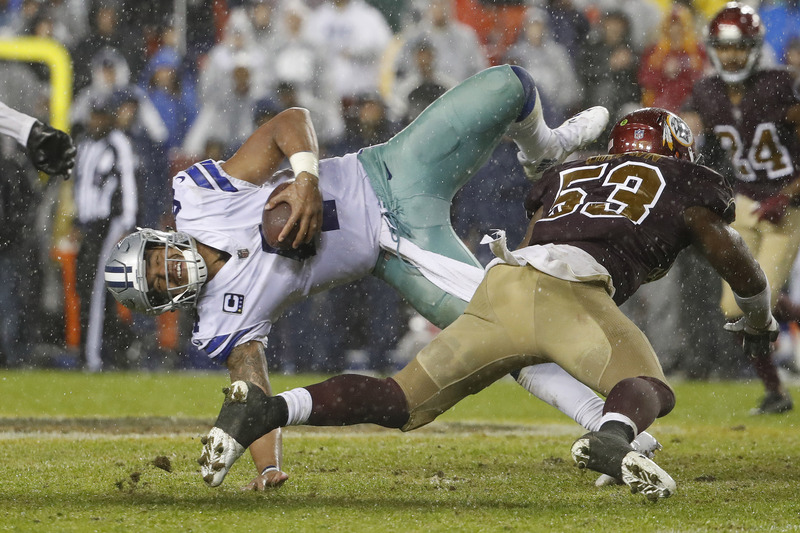 Playing in a driving rainstorm that made it difficult to hold onto the ball, let alone throw it, Dak Prescott completed 14 of his 22 passes for 143 yards as Dallas (4-3) heeded the message on Elliott’s cleats to “Feed Zeke.” With another hearing on his NFL suspension coming Monday, Elliott carried the ball 33 times, scored twice for the second consecutive game and surpassed 100 yards for the third time in a row. Elliott said he didn’t think about his pending hearing, which could determine whether he’s suspended the next six games or will be available for the rest of the season. He didn’t have the chance to because he called conditions so treacherous that he struggled to hold on to the ball late because of the rain and cold. What could be Elliott’s last game until mid-December turned in the second quarter when Dallas’ Tyrone Crawford blocked Nick Rose’s field goal attempt and Orlando Scandrick returned it 86 yards to set up a 1-yard Elliott TD run two plays later. Instead of the Redskins (3-4) leading 16-7, the Cowboys went up 14-13 and never trailed again. Washington QB Kirk Cousins lost one fumble and kick returner Chris Thompson lost another. Cousins was 26 of 39 for 263 yards and a 1-yard TD pass to Josh Doctson that cut it to 26-19, but Rose missed the extra point and Dallas sealed it with an interception return for a touchdown by Byron Jones with 21 seconds left. Signed to fill in for injured kicker Dan Bailey, Mike Nugent was wide left from 49 yards on his first attempt for the Cowboys. Nugent, who worked out for the Redskins last week when they decided to sign Rose to replace the injured Dustin Hopkins, shook it off and made field goals from 36, 48, 27 and 37 yards in the second half. The Cowboys took full advantage of the Redskins’ bevy of injuries along the offensive line, sacking Cousins four times. Washington was without starting left tackle Trent Williams, center Spencer Long and right guard Brandon Scherff because of knee injuries and had two rookies making their NFL debuts — Chase Roullier at center and Tyler Catalina at right guard. “The D-line has done a great job getting a lot of pressure: strip sacks, making plays,” Dallas linebacker Sean Lee said. Redskins WR Terrelle Pryor was a nonfactor for a second consecutive game. Cousins threw Pryor’s way just once, a week after four targets and two receptions in a loss at Philadelphia. Cowboys: WR Cole Beasley left in the third quarter with a concussion. Redskins: TE Jordan Reed injured his right hamstring late in the second quarter and did not return. … TE Niles Paul was concussed on a helmet-to-helmet hit during Rob Kelley’s 1-yard TD run in the first quarter. … LT T.J. Clemmings left with an ankle injury and LG Shawn Lauvao left with a stinger. … DL Matt Ioannidis broke his hand, S Stefan McClure suffered a hamstring injury and S Montae Nicholson a shoulder injury. … CB Bashaud Breeland was inactive with a knee injury.